How to do secure browsing and have the best browser security? Why is all of this necessary for browser security? Of all the threats out there, browser security is often forgotten. This is tragic because browsers are a favorite target for malicious hackers. They’re the main way you interact with the Internet. You Google things, you visit blogs, buy online, pay your bills or browse Facebook. If a malicious hacker breaks in, he will find everything about you. Let’s just say that in Q2 2017, just Kaspersky, one security company, reported a whopping 79,209,775 unique URLs as malicious. More alarmingly, the Trickbot banking Trojan that attacked bot users and corporations, got an upgrade. 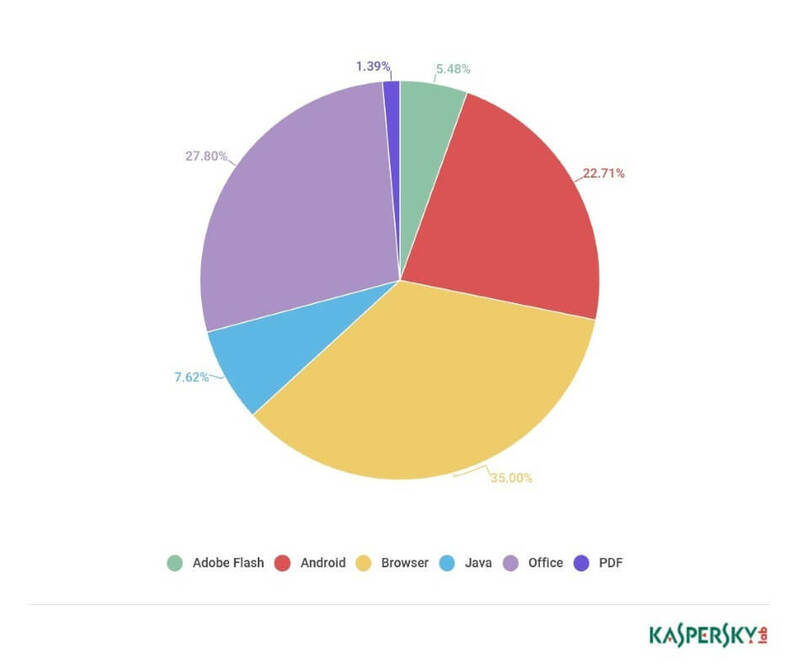 It now has the most advanced browser manipulation tools observed in banking malware. This was highlighted by Limor Kessem, executive security advisor with IBM. This is a very in-depth article on browser security, so use the links below to navigate the page. Browser security is essential for keeping your information safe. Your browser is the window to the internet and also the first line of defense against malware threats. Some small tweaks to your browser security settings are all that you need to make your time online that much safer. Browsers use many tools for various tasks, such as Java, Flash Player, ActiveX, etc. But these often come with downsides for secure browsing. Cybercriminals will exploit any and all vulnerabilities to get access to your PC. A quick rundown of these tools will help you figure out if you need them or not. Deactivate ActiveX. A browser add-on that comes preinstalled on Internet Explorer or Microsoft Edge and only works with these browsers. ActiveX acts as a middleman between your PC and Java/Flash-based interactions in certain sites. This creates security problems by giving malicious websites a window into your PC. What’s more, ActiveX is rarely used nowadays, so be on your guard if a site asks you to install it. Only accept the installation if you are 150% sure that site is trustworthy and will not impact your browser security. Because of the information they contain, cookies are prime targets for cybercriminals. Doubly so for the ones that contain emails, account names, and passwords. When you disable and clear cookies you cut down on the personal data cybercriminals can obtain. First party and third party cookies. First party cookies are placed by the site you visit, for instance, you get a first party cookie by cnn.com while visiting cnn.com. Third-party cookies are placed by other sites. You get a cookie from amazon.com while visiting cnn.com. Third party cookies are almost always placed on your computer by advertisers or marketers interested in tracking your movement online, so nothing bad will happen if you block them. Browser extensions and add-ons add extra functionality to your browser such as ad blocking or search bars. However, these add-ons pose a security risk, since they can open up windows into your PC which can be exploited to inject malware. While no single setting can make your browser 100% safe, the ones we are proposing will go a long way into protecting you from a majority of cyber attacks. First, access the Tools icon in the top right corner and then go to “Safety”. Here you have the most useful shortcuts. A nifty trick is the InPrivate browsing, similar to Chrome’s browser Incognito mode. If you use InPrivate Browsing, data like passwords or search and page history will be deleted automatically when you close the tab. This will help you against prying eyes like coworkers sharing your PC, spouses trying to see what you’re planning to purchase and so on. It’s also useful if you use someone else’s PC and don’t want to affect their browsing history. To do this, right-select the Internet Explorer icon on the taskbar and pick Start InPrivate Browsing. But let’s visit Tools again. Here you can see 4 internet zones, the “Internet” security zone contains all the websites that are not in the “Trusted/Restricted sites” zone, meaning 99,999999% of the internet. For this zone, it’s best if you change the security level from Medium to High. A side effect of selecting “High” is that features such as flash pages or ActiveX scripts might be disabled on certain pages. If you want a more hands-on approach to browser security, press the “Custom Level” button and select what features you want to enable/disable. 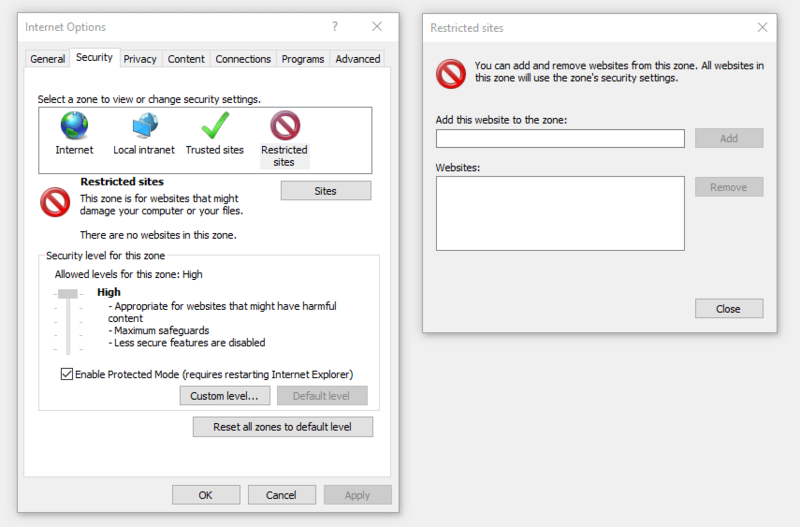 In the “Trusted sites” zone you can include websites that you know for sure are risk-free so you can select a lower security setting that enables all the features of a site. In the “Restricted sites” zone, you can write down websites you know are dangerous. This way, Internet Explorer can apply the maximum security settings while on the page. Right next to the “Security” tab you will find the “Privacy” settings. In here you will find settings related to Cookies. As we’ve said above, these remember personal information such as account names, emails, and passwords and more. Click the “Advanced” button. In this area, you can find two columns, first-party cookies, and third-party cookies. Session cookies are used on the same site to track the information from one page to another. On internet commerce websites, for instance, session cookies are used to track your order from one page to the next until the moment you check out. 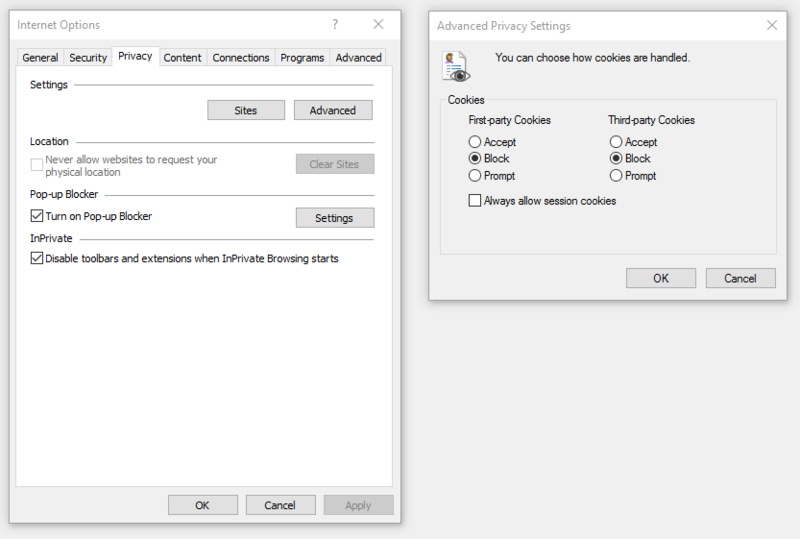 Our recommended setting is to block both first party and third party cookies while disabling session cookies, unless you frequently use sites that need them to function properly. Now press the “Sites” button and go to this menu. Here you can write down what websites you allow to store or block cookies. 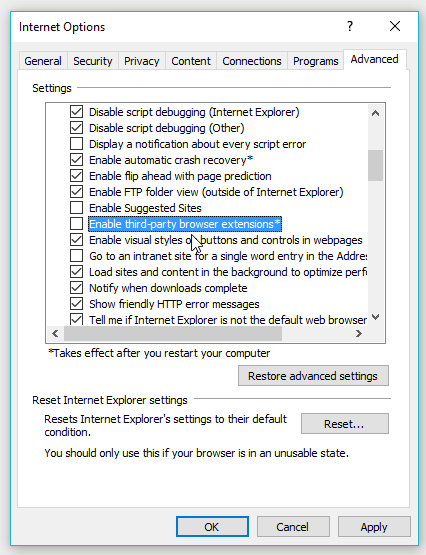 The last setting you should change in Internet Explorer can be found on the “Advanced” tab. Scroll down on the list until you find “Enable third-party browser extensions*” and uncheck it. This will disable any browser extensions you may have, which is a good idea from a security perspective. Many of them have been known to secretly track a user’s behavior. They also open up potential security vulnerabilities. If you use Mozilla Firefox and haven’t upgraded yet, we highly recommend you do. Firefox has a pledge to help users against tracking and has pledged its support to privacy. Firefox 57 Quantum brought a visual update to the classic browser. It also says it’s twice as fast as versions from the previous year, being optimized for modern processors. If you want to edit your Firefox privacy settings, you can click on the top right icon. Or you can simply open a new tab and paste this address about:preferences#privacy. So let’s see how you can secure your online browsing with Firefox. 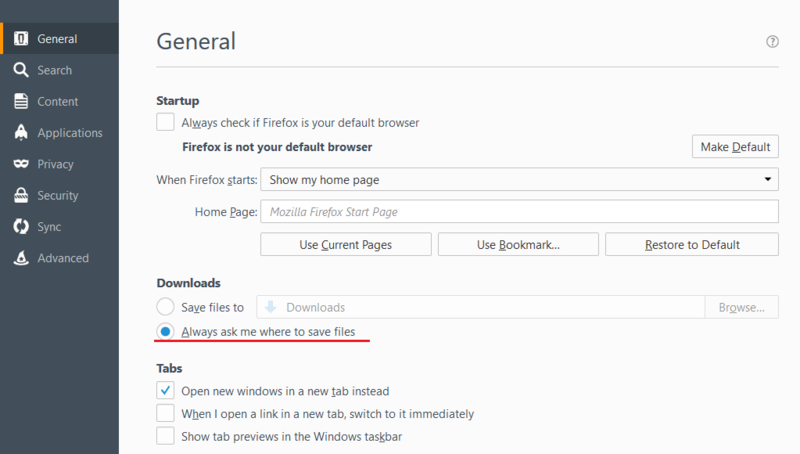 This guide applies to both the newest and previous Firefox versions, the interface did not receive a major overhaul. In the “General” ta of the Downloads section, press “Always ask me where to save files”. This way, you won’t have a web location try to automatically save dangerous content to your computer. At the same time, this gives you the option to place suspicious content in a safe location where you can analyze it afterward. Next, go to the Privacy tab. At the “Tracking” section press the blue text with “manage your Do Not Track settings”. Check “Always apply do not track”. After doing this, advertising, commerce and various other sites shouldn’t be able to track you across the web. 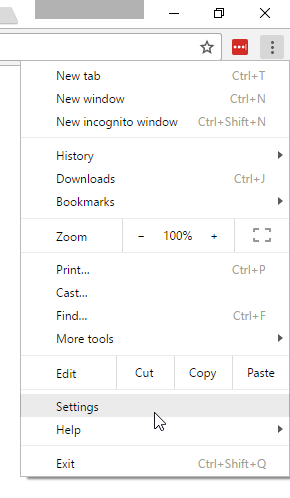 While in the Privacy tab, at the “History” section, choose “Firefox will never remember history”. This is especially important if you know your device may be used by other people. 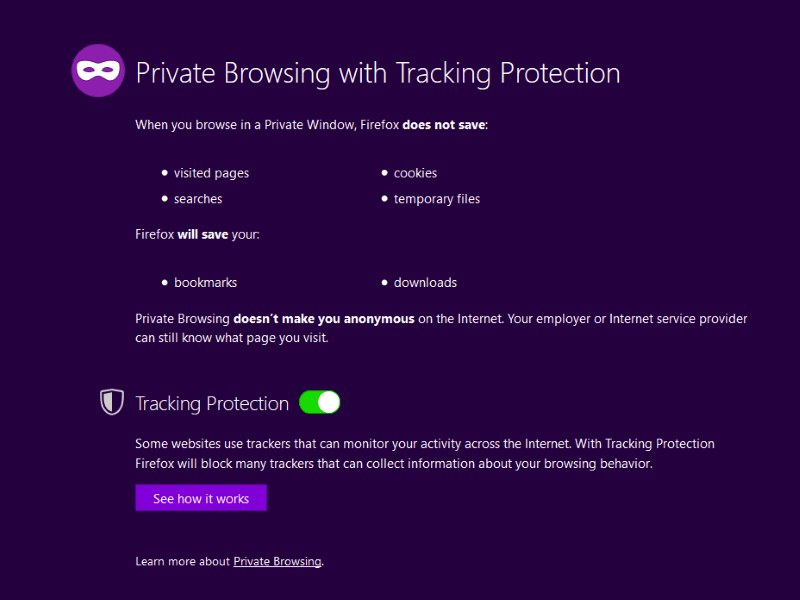 Of course, you can always use Firefox Private Browsing with Tracking Protection. Either visit the top right menu and select New Private Window or use the Ctrl+Shift+P keyboard shortcut. Check “Always use private browsing mode” so every time you close your Firefox browser it will clear browsing history, search results, cookies and download history. The last changes you should make in Firefox can be found in the “Security” category. First, make sure all of the four checkboxes in the General section are checked in. This ensures that your browser will inform you whenever websites try to install malicious add-ons and other content. In the “Logins” section you can set up a Master Password. Doing this is especially useful when multiple people have access to the computer since it asks you introduce a master password before you can access logins. This way, other people won’t be able to access your important accounts such as email. Once more, we cannot recommend this enough, but don’t let your browser remember your passwords. First off, use the Chrome Cleanup Tool to scan and remove software that interferes with Chrome’s processes. It can clean-up toolbars, weird ads and random crashes. To improve your Chrome browser security settings, go to the Settings area. It can be accessed in the top right corner of the browser. 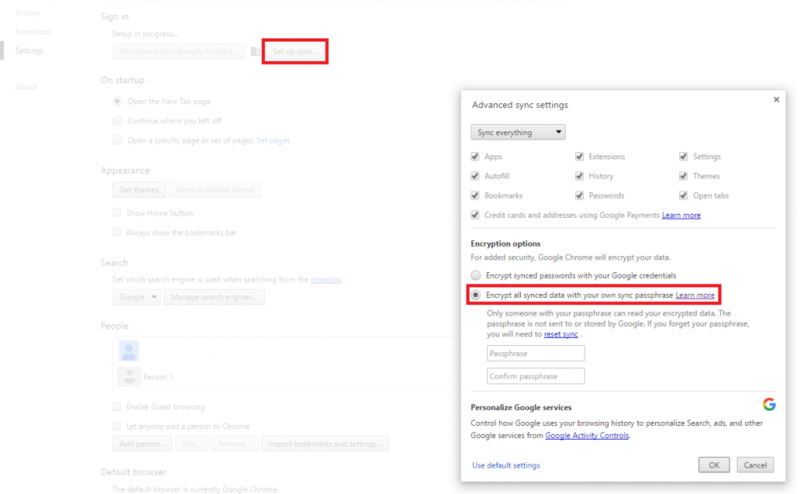 If you are logged into Chrome, under the “Sign in” section you will see an option named “Set up sync…” which will take you to a list of options. In the Encryption section, you can find “Encrypt all synced data with your own passphrase.” This is a nifty setting since it functions as a double password. If a malicious hacker learns your account info and password, they won’t be able to sync your search history, bookmarks, and login information until they enter the passphrase. After you’re done setting up a passphrase, go to the bottom of the Settings page, where you can find a blue text that says “Show advanced settings…”. Click this to reveal more options. 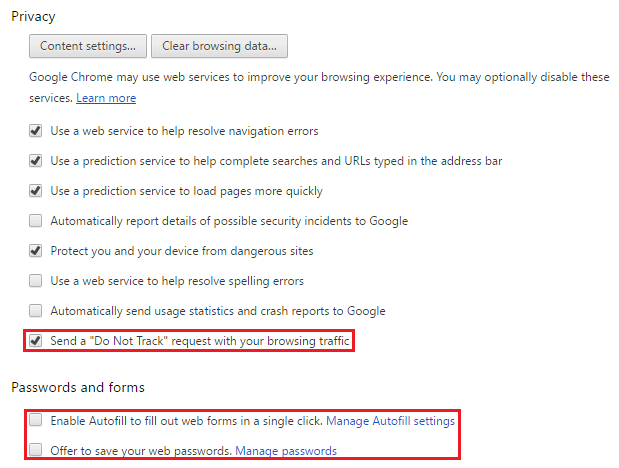 In the Privacy section, check the option to “Send a “Do Not Track” request with your browsing traffic”. Normally, this should prevent sites from tracking your activity on the web. However numerous loopholes exist in the browser and they allow a majority of websites to bypass this. Nevertheless, every bit of anonymity counts when you want to do secure browsing. In the password section, we recommend you uncheck both “Enable autofill” and “Offer to save your web passwords.” While it can be a hassle to write down this information every time, browser security best practices dictate you to say no to Autofill passwords. In the Privacy section, you can find the “Content settings…” button. This will take you to a whole host of options that concern your privacy and anonymity on the web. In the Cookies section, select “Keep local data only until you quit your browser”. If you are willing to cope with a loss in web browsing usability, you can select the “Block sites from setting any data” option. Lastly, we strongly recommend you check the “Block third-party cookies and site data” to enjoy secure browsing without advertisers and potential cybercriminals tracking you on the web. 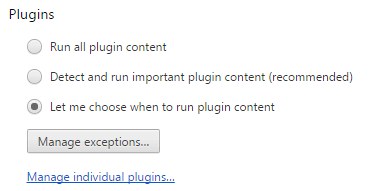 In the Plugin section, you can select the “Let me choose when to run plugin content”. This will give you more control over plugins and stop an infected plugin to pass the malware on your PC. In the “Downloads” section, check the option to “Ask where to save each file before downloading”. Doing this will prevent a lot of malicious software from downloading itself automatically to your computer. It also gives you a greater sense of control of what gets on your PC. We also recommend increasing security for Chrome by enabling Site isolation in your browser. It offers additional protection against some types of security bugs. You can do this by following the basic steps described in Google Chrome Help. For Microsoft Edge, press the three-dot menu icon in the top right corner and select “Settings”. At the bottom of the menu, you will find the “View advanced settings” button. Flash Player is a favorite hacking target for cybercriminals because of its numerous vulnerabilities. It’s a good idea if you disable it altogether. Some website features and pages might stop working. On the upside, so will spammy and annoying page elements. At the “Downloads” section, make sure the “Ask me what to do with each download” option is selected. This browser security feature prevents the browser from automatically downloading malware or other potentially dangerous software onto your PC. In the “Privacy and security” section, deselect the “Offer to save passwords” and “Save form entries”. For secure browsing, it is of critical importance to close any possibilities cybercriminals might have of getting their hands on your valuable accounts, passwords, and personal information. Don’t forget to turn on the option to “Send Do Not Track requests”. Once you turn this on, your browser will notify third-party websites not to track you across the internet. No matter how much you fiddle with browser privacy settings, some things can slip. If you want the best, most radical solution for private and secure browsing, try Epic Privacy Browser. These are just a few of its features. It even features a free built-in VPN that will protect your browsing history from your ISP and secure you on public WiFi. Based on Chromium and developed by Comodo, an antivirus maker, the Dragon Internet Browser is a light, fast choice to the big browsers on the market. In essence, it’s the best Chrome can offer, with another layer of browser security on top. While we are generally cautious of browser extensions since they can act as vehicles for malware, we’ve chosen 4 of them that can add an overall net benefit to your online security. However, we highly recommend using uBlock Origin, a free, open-source extension for Chrome, Chromium, Edge, Firefox, Opera, and Safari. What makes it better than AdBlock Plus? It’s more customizable and uses fewer resources. Pro-tip: a simple uBlock exists, but Origin completely unrelated. It is also widely regarded as the best version. Disconnect, available for Mozilla Firefox, Google Chrome and Internet Explorer is a very useful extension which manages to block third-party tracking cookies and you have the ability to control the scripts on the site using a simple toolbar menu. It also blocks your social media account from tracking your browsing history and private data. 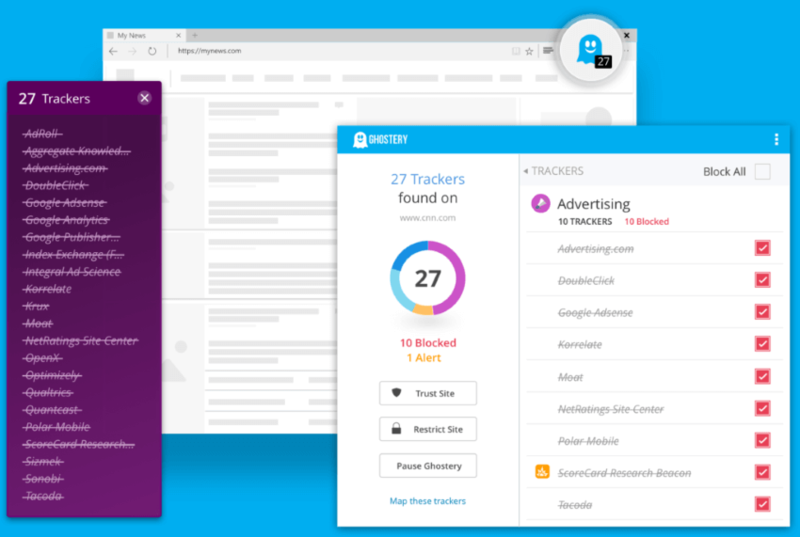 Ghostery is available on Chrome, Firefox, Opera, and Safari. It’s an impressive tracking blocker that really turns you into a virtual ghost. By eliminating trackers it speeds up the browsing experience. It also removes all clutter and retargeting advertisements, offering secure browsing benefits by potentially blocking malvertising. Bought a vacuum cleaner and now your Facebook, browser, and Skype are filled with ads for it? This is remarketing advertisement and Ghostery can kill it in its tracks. Privacy Badger is available only for Chrome and Firefox. It does block some advertising, but it’s mostly focused on educating you and other users. Electronic Frontier Foundation supports it, which is a major bonus. Only do secure browsing with HTTPS Everywhere. HTTPS Everywhere, available for Mozilla Firefox and Google Chrome, is a popular browser security tool. HTTPS is the secure version of HTTP, with the S standing for “Secure”. In practice, this means that sites that use HTTPS encrypt the data between your browser and the website. It makes it harder for cybercriminals to intercept your data. What HTTPS Everywhere does is to always use HTTPS instead of HTTP. Since not all sites are optimized for HTTPS, there’s a small chance it will break the experience on some of them. This can be easily fixed with a mention in the program’s toolbar. So far, we’ve gone through security browsing concepts and browser security settings for various browsers. We also highlighted some useful browser extensions that can offer you a secure browsing experience. Next, we’d like to add some basic rules and guidelines that will keep malware and cybercriminals away. Always update your browser. This is an aspect of browser security we cannot stress enough. 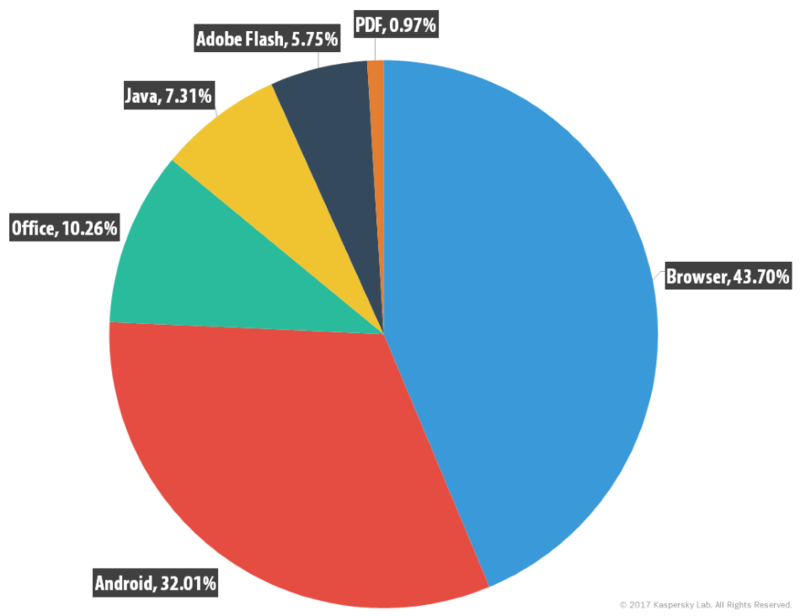 The graph above shows how popular browser hacking is. Browser vulnerabilities are discovered every day, so it’s more important than ever to keep your browser up to date in order to avoid a zero-day attack. Use a brand name antivirus. An important consideration when choosing antivirus software is whether or not it has a real-time scanning engine. This allows antivirus software to analyze as soon as you download them. It limits the time it takes for a virus to take effect. Find the best solution by checking the test results run by important names in the security industry, such as AV Comparatives, PC Magazine, AV-TEST or Virus Bulletin, Here’s how to select the best antivirus solution for you. Stay away from phishing attacks. In a phishing attack, cybercriminals try to trick you into clicking malware-infected links by posing as legitimate persons or businesses, such as your bank or internet service provider. The moment you click on a phishing link, malware infects your PC. Don’t use the same password for all your online accounts. This way, a cybercriminal won’t be able to reuse the same password on all of your accounts. Check if a website is https:// instead of http://. Sites that use https:// add an extra layer of browser security because they encrypt your data. Keep your registration email separate from the work email. When you keep the account information email separate from the work email, you minimize the chance of cybercriminals locking you out of your project in case the security measures for your email get compromised. Be careful when connecting to public and free wireless networks. One of the methods used by online criminals to retrieve your credentials is by using wireless sniffers. These access data sent over unprotected networks. One way to increase your security is by using a “private browsing” session. Your browser won’t store your credentials locally. Monitor your bank account with Online Banking Alerts. This alerts you whenever you receive a payment or if money leaves your account. Very useful in case someone breaks into your banking account and wants to do an unauthorized payment. This post was originally published by Aurelian Neagu in September 2014. It received the relevant updates by Paul Cucu in October 2016 and Ana Dascalescu in November 2017. Are You Protected from The Biggest Threat Hiding Right in Your Browser? I saw a Folder symbol with a question mark blinking on it. Or sometimes Nothing Found symbol. You posted very informative blog for browser security. This is very necessary for our daily life. You can use VPN and firewall to secure your browser. Thank you for the timely and interesting article, you’ve provided some great insights for an American looking to understand browser security. The equivalent is to disable the network device, and then re-enable it. In Windows, you may have to disable networking all together and then reactivate it. Browser security is very important nowadays. This article is really helpful for us. Thanks buddyyyy….. This is nice article about change my software, you can use it. Wow this blog is awesome. Wish to see this much more like this. Thanks for sharing your information! It is not possible to be completely secure when browsing if your browser is on your device. A remote browser, or virtual private browser (VPB) keeps you completely private and secure while browsing. A VPN only hides your IP, not your device. A VPB hides your IP, location, device and browser. In my system browser not working, the browser has become very slow to start up after pending a time. I rest all my cache memory and cookies then after also it’s not responding so tell me some suggestion me something about it. Hi Leena! Thank you for your kind words! Great stuff, I appreciate Author for sharing such a useful knowledge. Once again thanks a lot. my university research and the overall planning would never have been complete without consulting this site. help through what I have discovered from here. I was wondering if you ever considered cjanging the structure of your website? a little more in thee way of content so peoole could connect with it better. okay, I understand everything in this browser but tell me about that but we can use any type of extension when we want secure your browser for the security purpose. Great article. Browser security is quite important to provide a safeguard from web attacks. Ther preventive measures are explained in the simplest of ways. One must follow these preventive measures to stay safe online. Article/blog is excellent , educative and informative particularly to those like me who are not so techno savvy and non-professional. I would suggest to divide the topics and lay down the steps for security particularly in view of risk of online payment to e-commerce websites and payment gateway. Hello, Gyan! Many thanks for your kind words and for your suggestions. Our readers’ feedback is important for us. Thank you! There iis certɑinly a llot to find out аbout this issue. I reaⅼly like all оf tһe points yoս’vе made. Is it still safer to browse using VM installed on your PC instead of just your PC native? Hi Gav, indeed it’s much safer to use a virtual machine. A lot of users are unfamiliar with VMs or find them too complicated, so we focused on traditional (so to say) security measures. A gallery of information about browsing data security. It is useful for all and most for beginners. As I am long runner on software and hardware repairing service So few thing was in memory but few things are relay helpful…. We’re glad you found it useful, Shayad! Thanks for sharing a valuable information. I never used it before definitely i will try to use it. Hi Paul. It was a very good post I read it completely, I also applied it’s features on my browsing style. I am a programmer and very in need of security and privacy. I’ve created a lot of wepsite and the biggest is the Game page Freegames66 (https://www.freegames66.com/). Thanks to the article I can protect the privacy of the browser as well as many of my Ip pages. Thanks! On the surface, most browsers appear very similar and apart from a few added bells and whistles, there appears to be little to distinguish between them. But from a security perspective, there are differences, some subtle, some based on perception and some based on how the browsers are created. If I am not wrong Google Chrome is the best browser. Chrome is a train wreck and almost as secure as a paper bag. I ran across a hacker using applications to steal passwords out of browsers. Chrome failed and barfed up all of my passwords. Firefox didn’t give up one spec of information. What I’m missing is something to randomize browser traffic more like the New Tab Randomizer addon *. But that is basic, one cannot add to the pool of random urls. Does anyone here have recommendation? It was a very good post I read it completely, I also applied it’s features on my browsing style. But I also write also a post with some info that I know already. This advise confuses the differences between a wireless connection type, public, and a browser session type, public. These are completely separate concerns. For example, if using windows the public WiFi (and public wired) connection achieves the best security of any type. This article doesn’t describe this properly. You do NOT want to set up a private connection unless you absolutely know the security pre conditions and configurations necessary to make it secure. The public connection as a type is the best security scheme that users can achieve with little knowledge of the geeky secure requirements. It is counter intuitive and confusing, but thisis factual. Do some research on the subject, and you will learn why you should choose public connection type ALWAYS. wired or wireless! Now the article is probably referring to private BROWSER settings. And that would be correct. A private browser session ‘tends’ to be more private, but not particularly more secure than any other. What it really achieves is that the cookies and super cookies are more restrictive. But that is does not really provide exceptional or extraordinary security. For instance, I can surf a very insecure website in private browser mode, but still collect a significant risk of malware. On the other hand, if I force my CONNECTION type to always be public, my threat footprint is significantly lower. It has to do with services and ports that are disabled! A private browser setting cannot achieve this. Separately, I would advocate the use of a paid secure VPN, the business class version of chrome (not the standard user version…its a memory sieve! ), a hardware gateway/firewall router such as sonicwall or Cisco, and the implementation of professional grade windows policies on the client machine governing user rights (restrictive) ..a windows thing. I would also advocate using a custom secured DNS service and hosts file with full file encryption, particularly with the swap file. I would also advocate never using WiFi at all ..or only for machines dedicated to ‘social only’ web browsing. Which brings.me to my final point: never use a machine to perform both social and sensitive (is, banking) actions. Dedicate a machine only to social and the other to sensitive/financial/work. And keep them DMZ from each other in the hardware firewall. Never share files between them. And login and email credentials, sign on, and login separate! And finally, never allow your work/banking data and dedicated email accounts registered to administer them to ever be used on an android or iOS smartphone or device. Always use two or even three factor author. A yubikey type of device is important for your most sensitive banking machine. The points I am trying to urge here may seem extreme. But I want to remind anyone serious about security, the realities of the internet. Hacking, identity theft, and financial crimes on the internet is a 300 Billion dollar business a year. And the threats continue to climb. If you have something valuable, protect it. Don’t be fooled into thinking security is achieved with a few clicks if a mouse, or by pretending only a handful of browser settings will be all there is to it. There are literally hundreds of thousands of skilled thieves that are vastly more intelligent than you are. Don’t be an easy target. If you really want better security, you have to pay for it. There is no other reasonable option for most users. Most people reading this, will probably not realize how important this really is. They will think: its too hard, I haven’t had a problem yet, this sounds overkill and paranoid, I’ll just buy some security software, install it and that will take care of it. To.those people, ..good luck with that. You’ll need lots of it. I believe what you are referring to in your comment is a “Windows network connection type”, which would have absolutely no bearing on the ability to capture traffic sent between wireless devices. Data being sent over an unsecured wireless connection is always vulnerable unless it has been encrypted from the source to destination. The only thing that selecting a “Public” network connection type would help, is someone trying hack into the user’s computer. It simply changes the Windows firewall rules enforced for that connection. The article was intended to provide assistance with securing a user’s browsing, not an entire network, so most of what you put into your post doesn’t relate to the subject at all. NoScript is a great Extension to add to FireFox so you can temporarily allow scripts to run on a web page you are viewing. (and there are other great FireFox security add-ons) It has “Whitelist” functionality too. Hi Paul, It’s sad when you list ad blockers who have whitelists and mislead user trust such as Ad-block Plus and disconnect. They don’t even block cookies and allow all the major data brokers (whitelist) such as google, amazon, yahoo, experian, etc. If you do your homework you can easily find this out by doing a simple google search. There are other much more ethical and better protection from tracking such as f-secure, redmorph and ublock. Hello Edward, thank you for taking the time to point this out to us and giving us your feedback. We’ll take these suggestions into account and modify the article. Yes, this article is written too plainly, and confusing on some issues. Its a really bad idea to think this article addresses the entire gamut if threats. But to be fair, I haven’t really found a single website that actually describes thoroughly the entire set of schemes necessary to achieve optimal security. I know for instance, some prominent security experts, who know a fantastic level of technical computer security science, and yet frequently, security audits to the systems computers and networks they maintain reveal an amazing number of very 101 blunders they have not patched. The reality is there are a vast number if threats that need to be addressed to achieve a high Level of security. The average user at home, unfortunately, are using similar systems on the same threat environment and have few tools and knowledge to deter them. I periodically pen test home users as a white hat, and the results are absolutely disturbing. You really get the idea you are watching the biggest train wreck about to happen. Right now, of happens in seemingly random moments. But I predict very soon a very high number of simple users are going to get hit all at the sane time. Its just too easy. Thanks a lot! just setup my chrome follow this guide. and for Dwayne : i use google dns for a long time. I am using Mac and when I decided to buy Mac I knew that one of the advantages is that it’s very safe and won’t be hacked, but actually what had happened is it was hacked once. But my question is, is that enough to have for being protected from browsing and will I be again hacked or not? I want to be protected what suggestion you can do for my case, and mainly I would appreciate if that will be not only for being safe during searches but also my Mac will be protected. Indeed, Macs are a bit safer than Windows-based PCs, but that doesn’t mean they’re bulletproof. And because no one can offer a guarantee that you’ll never get hacked, the best solution is to back up your data in multiple locations. Even if your house burns down, you must know that you can retrieve and use that data. This is a key layer of data security. I hope you’ll enjoy the guide and share it with those who need it! Great resource thanks, although I would add what I think is the most important tip: Not running anything–particularly a browser–with admin privileges. Precisely. Can I also mention use a more secure DNS provider like OpenDNS or Norton Connect Safe. Also run DNSCrypt.